Planning a wedding is a lot of work and we believe beautiful brides should make time for fun, too! 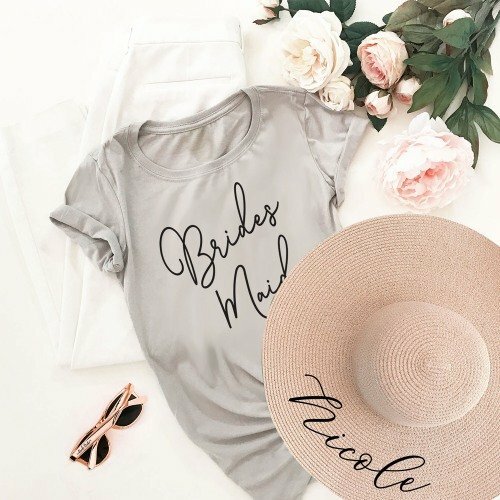 To help you celebrate your bachelorette status in style, we've put together a trendy selection of bride-to-be and bachelorette party clothing to outfit your entire bridal squad. For the best in Bachelorette Party 'Must-Haves' - here are our favourites! 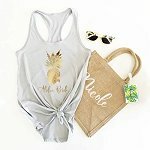 Tropical tank tops make a fun and stylish top to wear over your bachelorette party weekend or to any summer event! 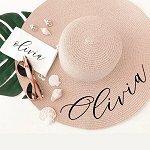 Each soft cotton tank is available in white, black, or grey and printed with one of our tropical styles in one of our beautiful metallic foil colors. Represent the bride with this bride's mate racerback tank top! 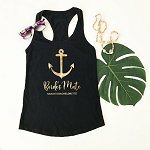 This is the perfect tank for a bachelorette party, shower, or to wear while getting ready for the big day! 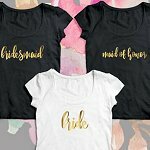 These fun bridal party tees announce your squad's status. Each Bridal Party Shirt is made of soft cotton jersey and features a scoop neck design with short sleeves. 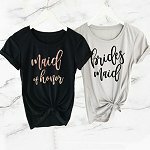 Make sure you pick up coordinating tees for the entire bridal party! 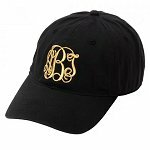 No Bachelorette Party is complete without your coordinating trucker hats! Available in an array of colors, each hat features an adjustable band for exceptional comfort! Make sure you pick up matching Bride Squad hats to coordinate with the Bride! Featuring a dazzling rhinestone closure, these customizable flip flops make a fabulous gift for every bride and all her bridesmaids. The fun flip flops are fit for all occasions, they are easily enjoyed long after the I do's are done. 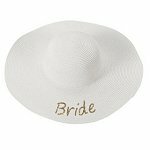 The Gold Sequin Bride Sun Hat is the perfect way to soak up the sun while enjoying a romantic honeymoon or fun bachelorette party. Wrap your Bride's Squad in luxury with this gorgeous silky satin robe embellished in fabulous glitter print! 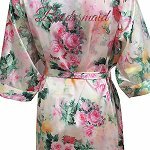 All the women in your bridal party will adore these gorgeous watercolor floral robes! Silky and soft, these Floral Satin Robes are perfect to wear while getting ready with your bridesmaids on your wedding day.